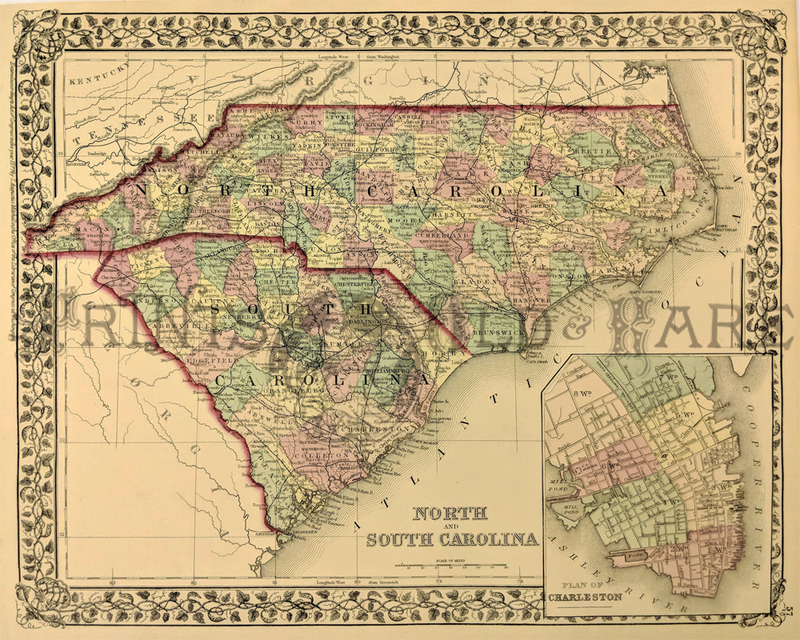 South Carolina Prints and Maps. 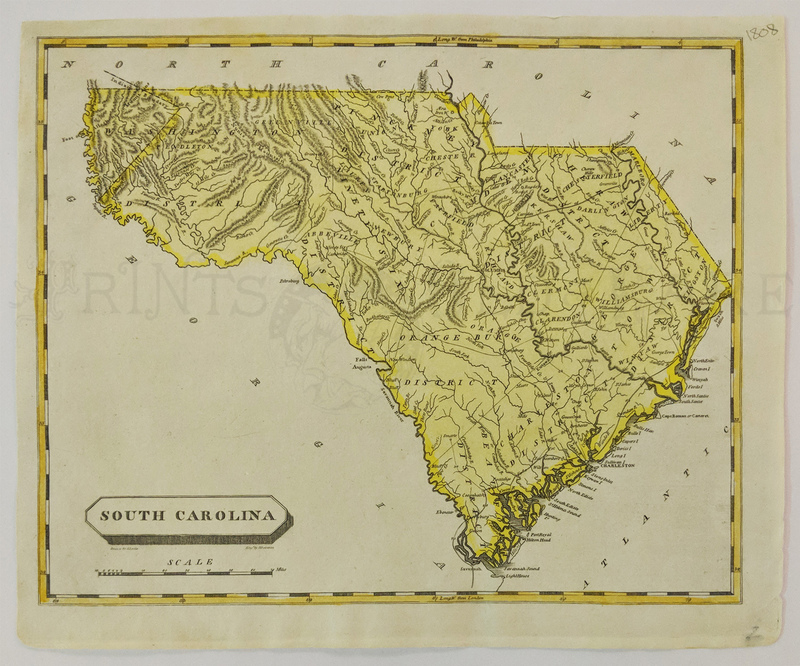 South Carolina, Samuel Lewis 1808 Hand colored copper engraved small early map of South Carolina by Samuel Lewis engraved by D. Fairman circa 1808. Civil War South Carolina views. 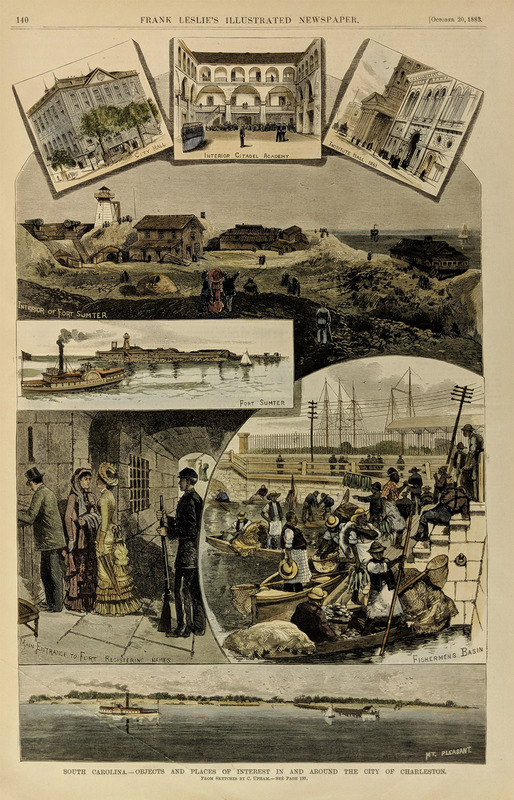 Large sepia litho views of Charleston Harbor during Civil War. 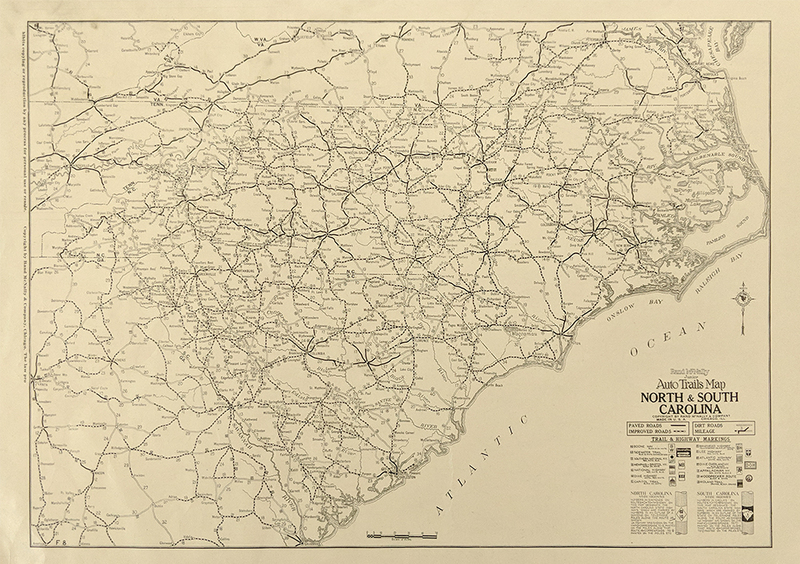 1919 South Carolina Railroad Map. Large very detailed map by Rand McNally. 28 seperate railroads listed and shown, plus steamship lines, etc. Printed in color. 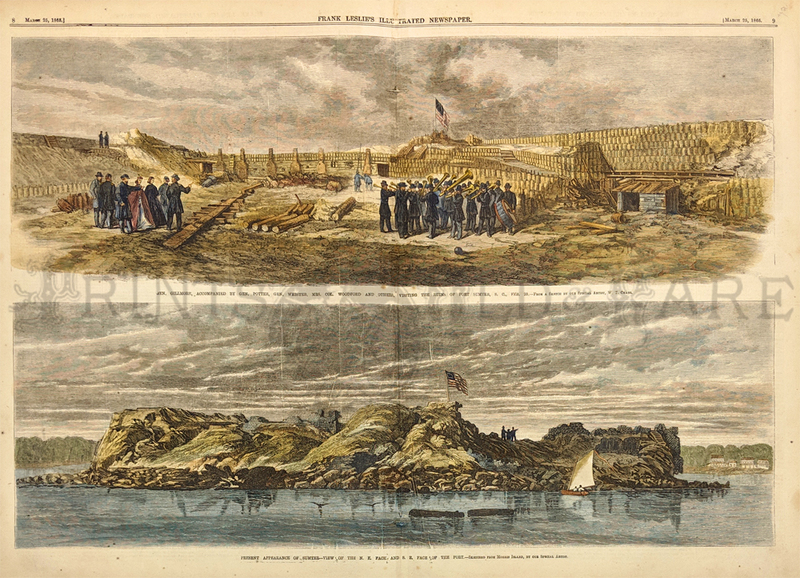 1861 Fort Sumter Interior view. Shows a 10-inch gun mounted as a mortar. This fort however as soon reduced to rubble as South Carolina artillery pounded it relentlessly, the first action of the Civil War. Excellently hand colored. 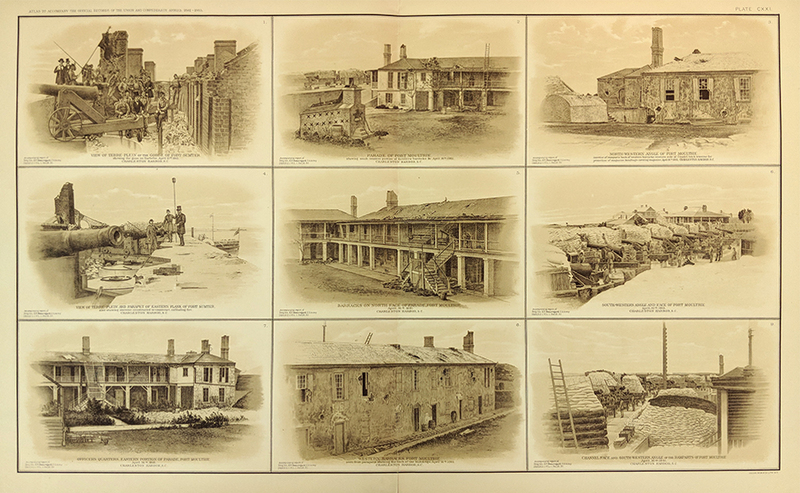 1863 Morris Island views during the siege. 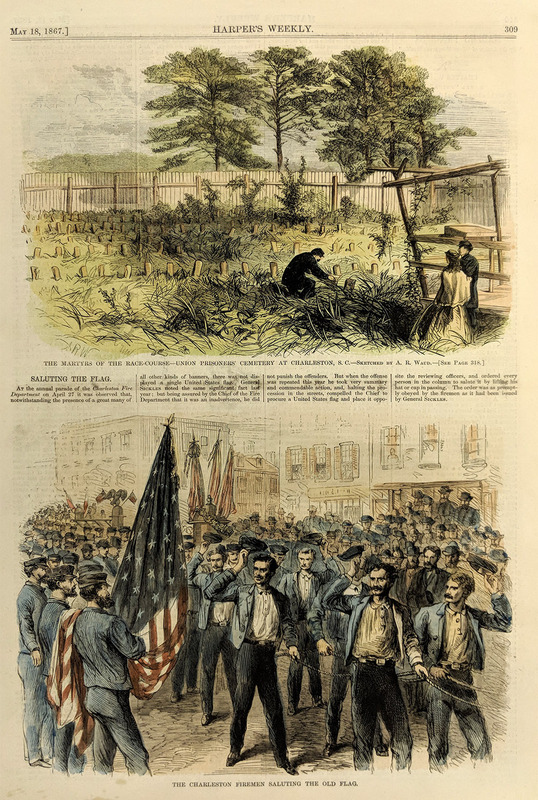 Four views shows Union Black soldiers. Harpers hand colored. 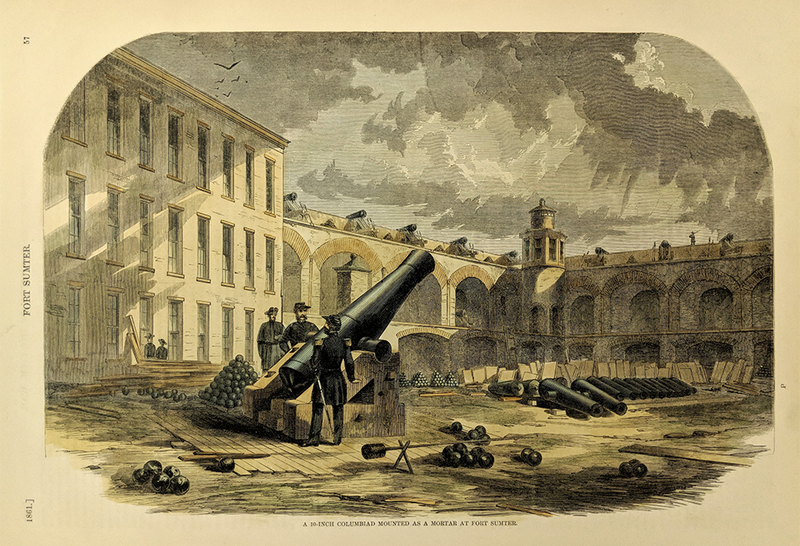 1863 Siege of Charleston. Two front page views from Harper's. Hand colored engravings. 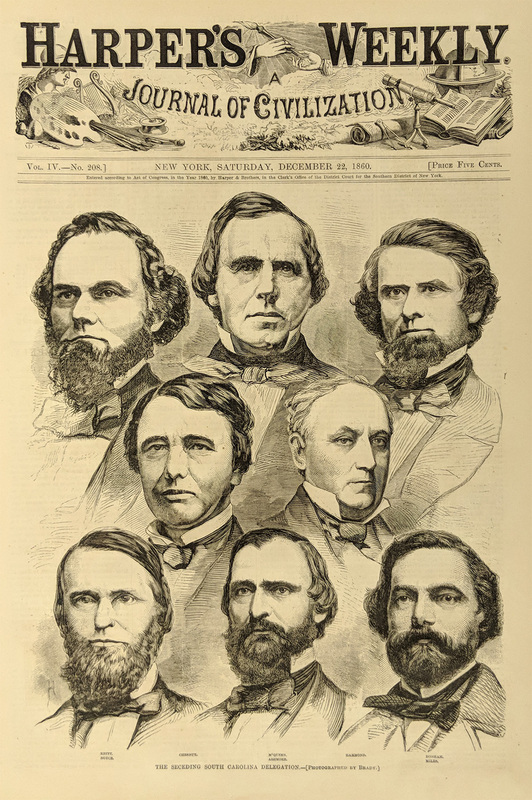 1860 Winslow Homer's depiction of the seceding South Carolina delegation to Congress on the eve of the Civil War. Original wood engraving featured in Harper's Weekly, A Journal of Civilization. 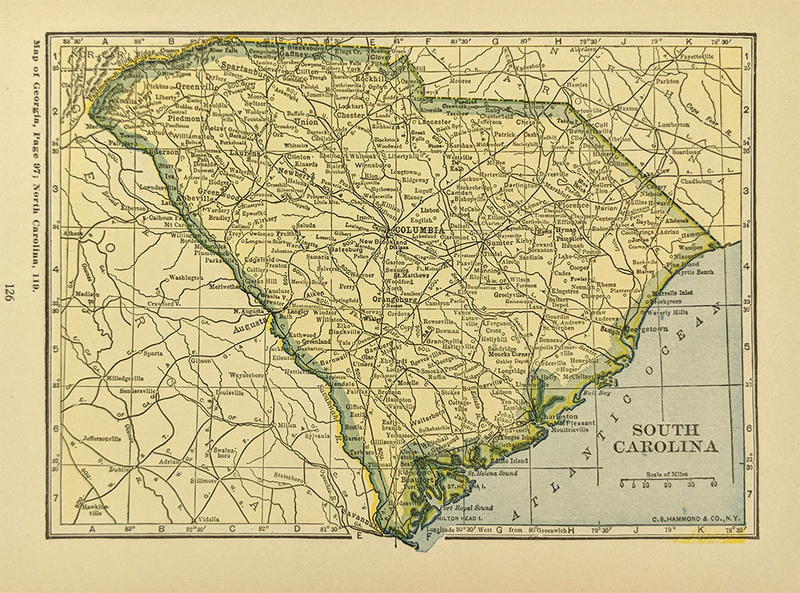 Large 1920 South Carolina Map. Color map from Rand McNally's 1920 Commercial Atlas of America. 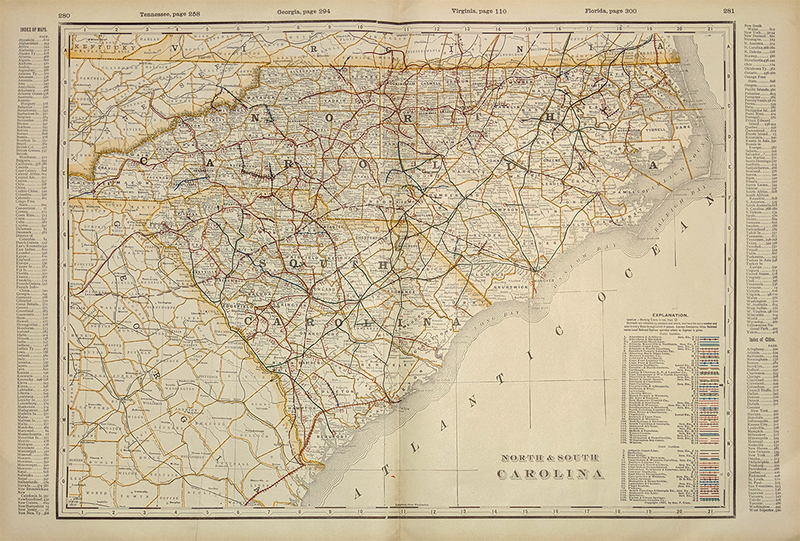 Shows the locations and names of each railroad line in the state. 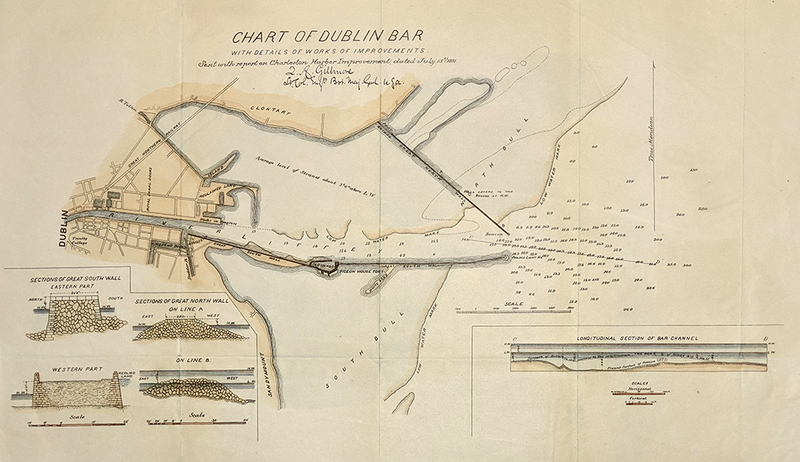 Locations of electric lines are shown, and steamship routes are marked along the coast. Also shows cities, towns and geographical features. 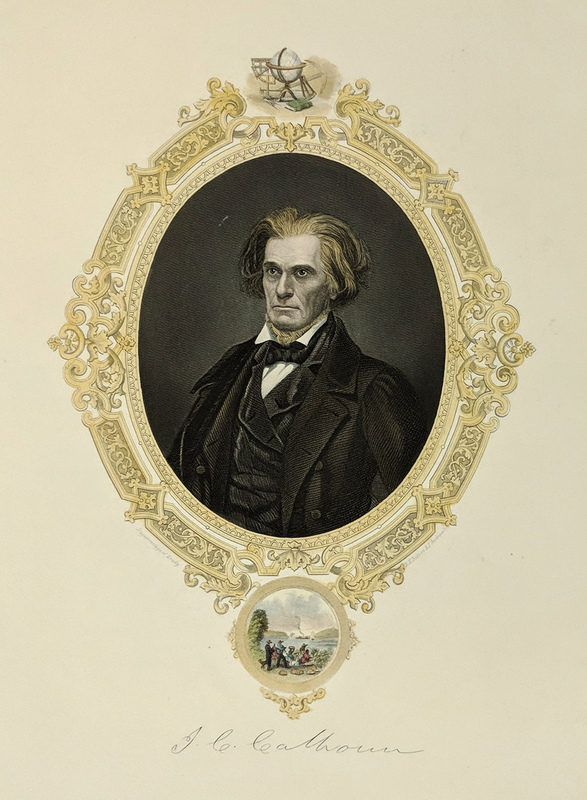 1854 Handcolored steel engraving showing aportrait of John C. Calhoun with a small inset below him of a cotton plantation. 1862 Rare - Pt. Royal, Sea Islands, Cotton in Port Royal South Carolina. 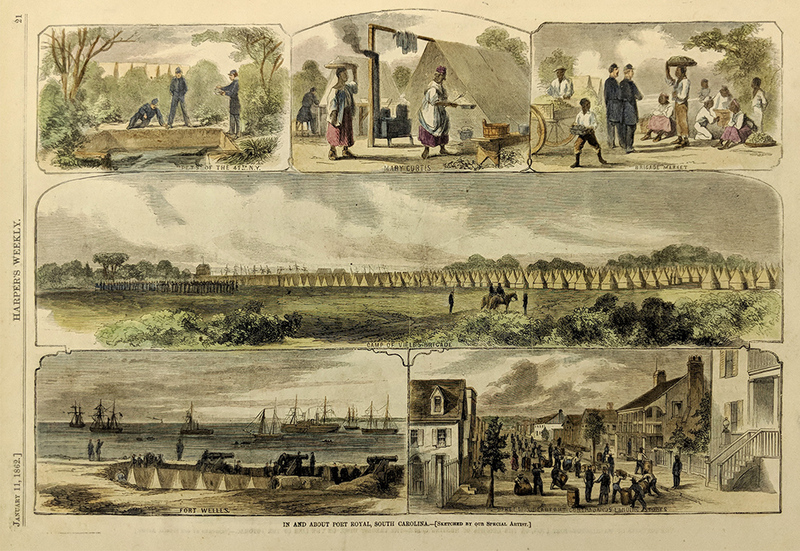 Hand colored, woodcut vignettes of slaves gathering, packing and shipping the crops. Rare Frank Leslie's engraving. 1886 Charleston South Carolina Earthquake Scene. 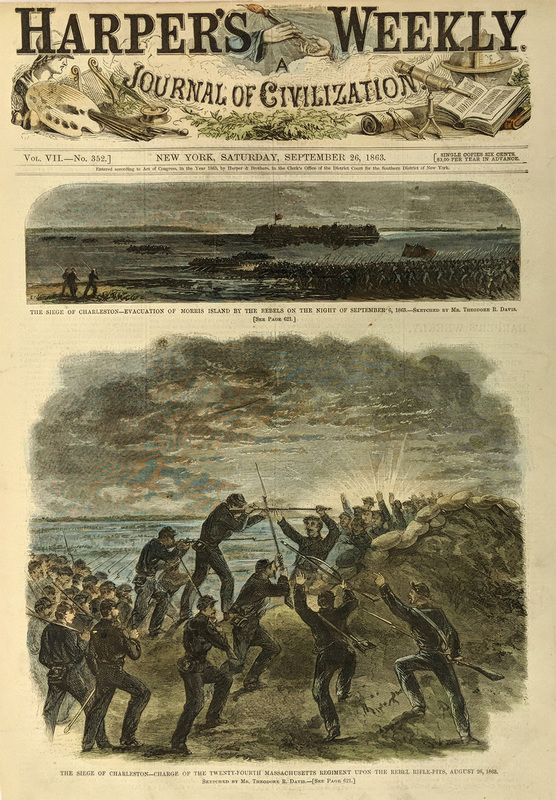 Dramatic, hand-colored engraving from the Sept. 11, 1886 issue of Harper's Weekly, titled "The Night of The Earthquake in Charleston, August 31, 1886." 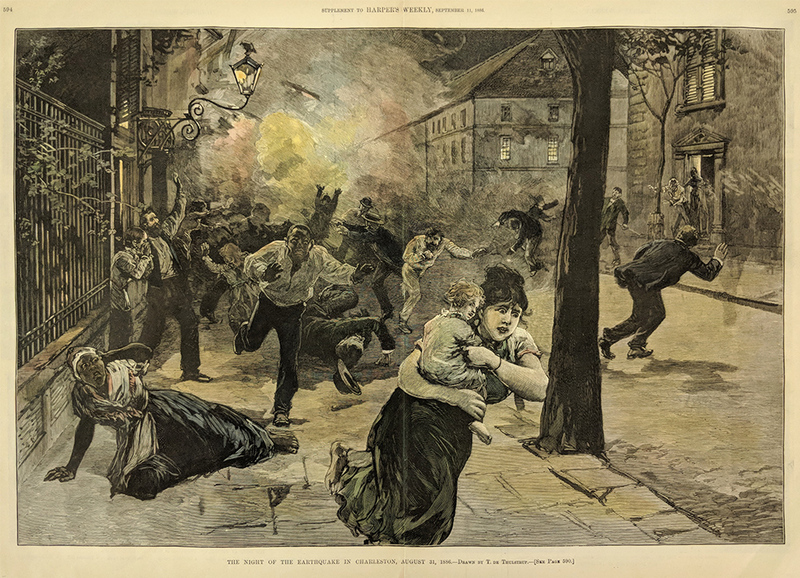 Shows chaos and panic in the streets, where people are fleeing the fires and collapsing buildings. Hand colored lithograph of the Revolutionary War. 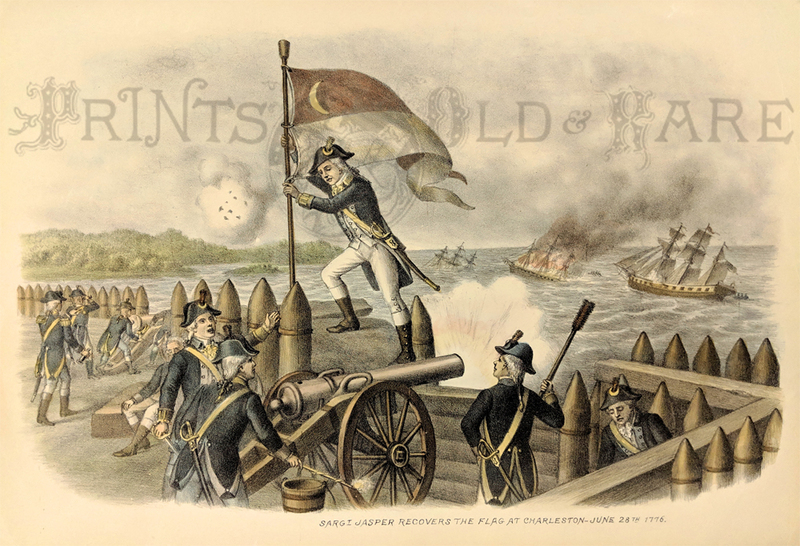 Published c1890 by Kurtz and Allison, image is titled, Sargi Jasper Recovers the Flag at Charleston - June 28th 1776. 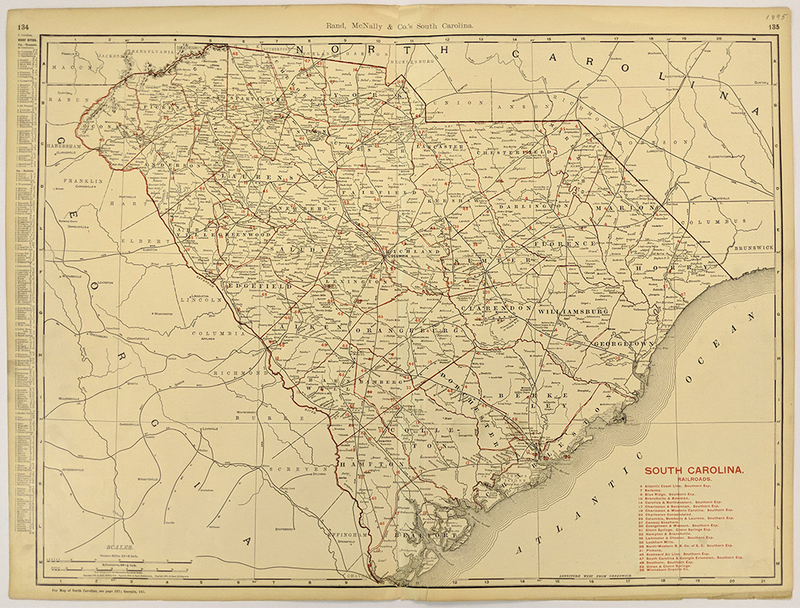 1925 Rand McNally Junior Auto Trails Map of North & South Carolina. 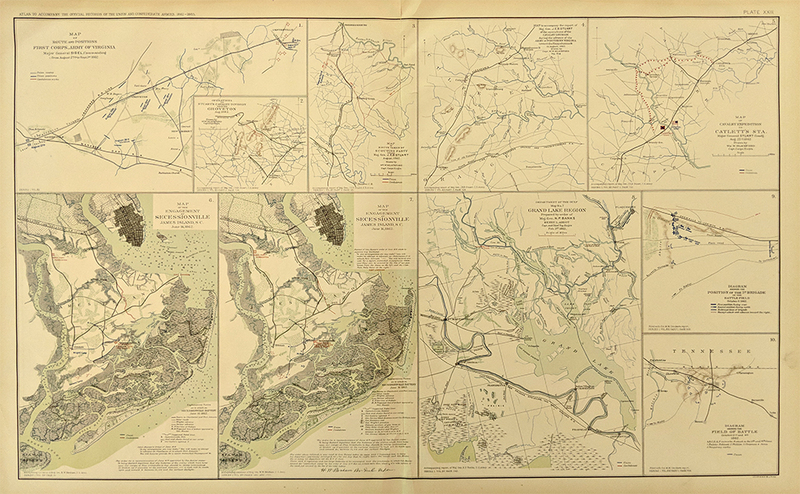 Map shows the Highway System, with different lines for paved roads, improved roads, and dirt roads. At the bottom of the map there is a section that shows the Trail and Highway Markings. 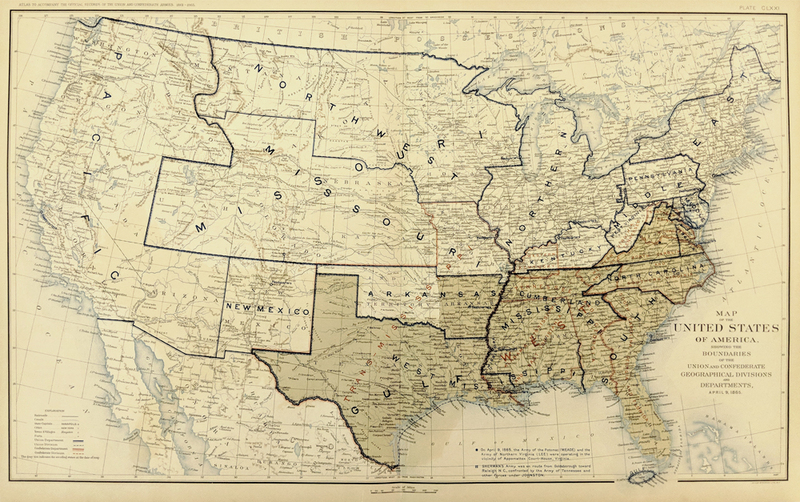 Map of the United States of America Showing the Boundaries of the Union and Confederate Geographical Divisions and Departments, April 9, 1865. 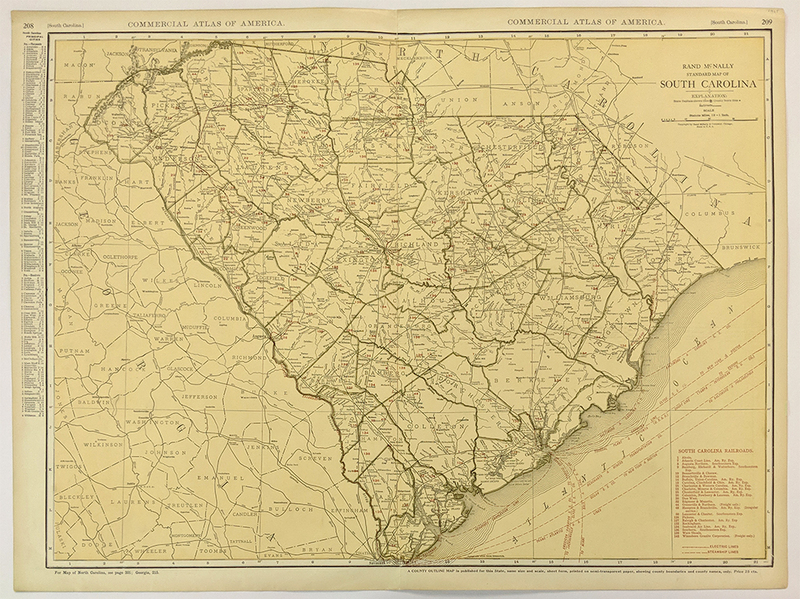 From The Atlas to Accompany the Official Records of the Union and Confederate Armies. "Battle of the Cowpens, Fought January 17, 1781." 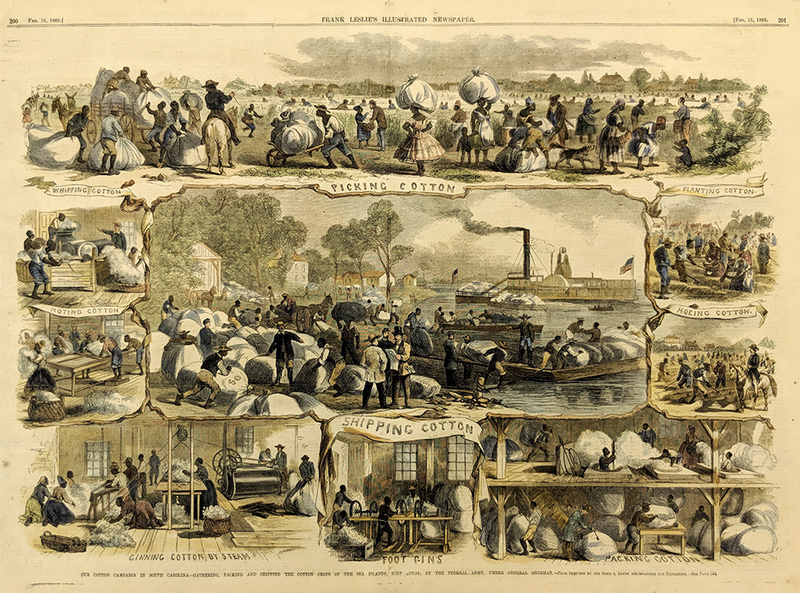 Published in the Ballou's Pictorial 1856. 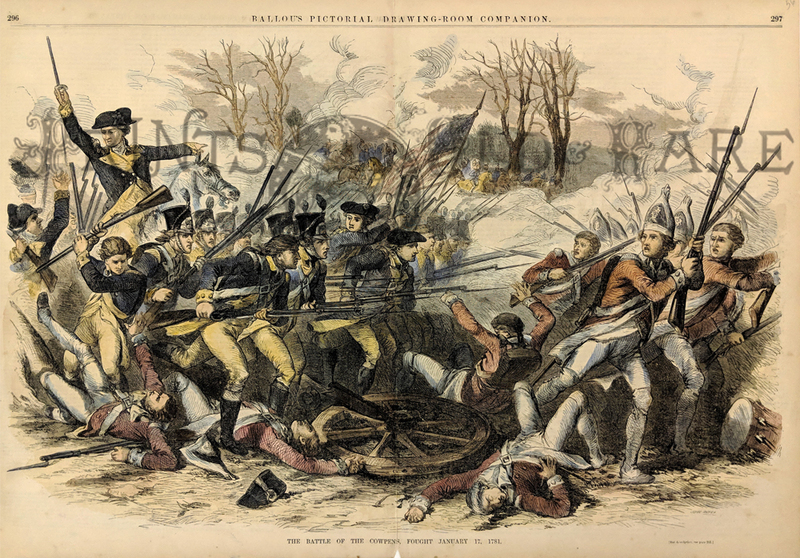 American forces used bayonets to drive the British back while the cavalry skirmished. 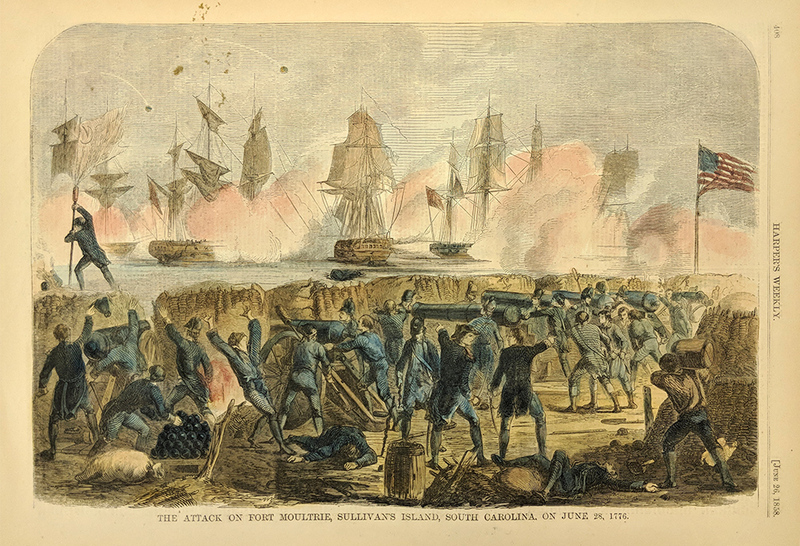 The battle was a victory for the Americans who reclaimed South Carolina from the British. Hand colored, wood engraving. 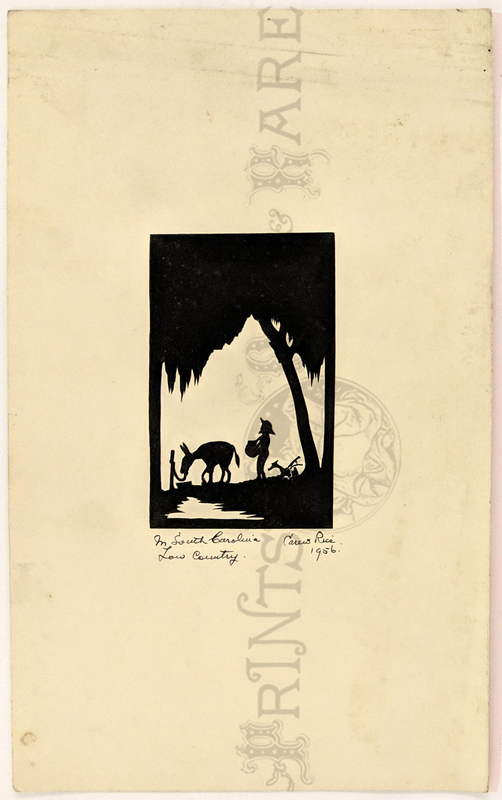 Careus Rice 1956 – “My South Carolina Low Country.” Original scissor cut silhouette by this famous black American folk artist. Dated and signed in pencil. Image size: 4 x 6 in. 1856 Ft. Sumpton. Charleston Harbor. 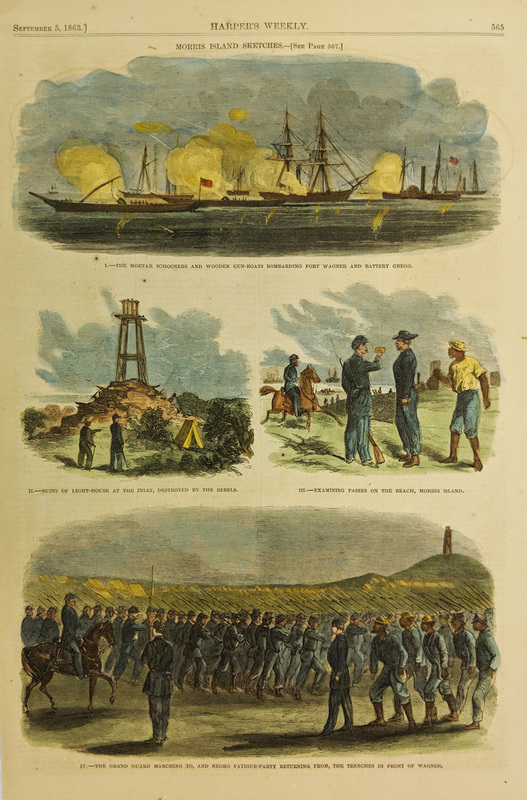 2 views of past Civil War showing visitors touring. Hand colored, wood engraving. 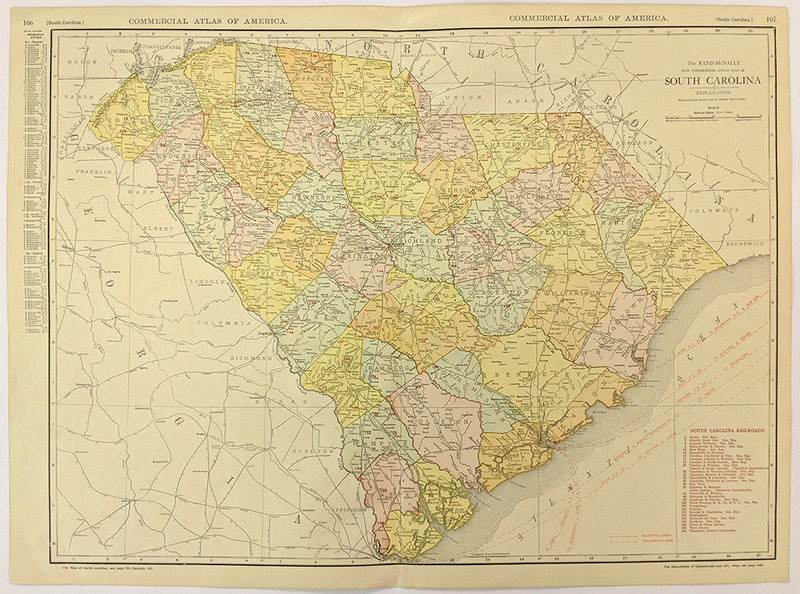 1873 Grey's Atlas Map of South Carolina. Railroads, common roads, canals, district capitals, p.o. and r.r. depots and counties are shown. 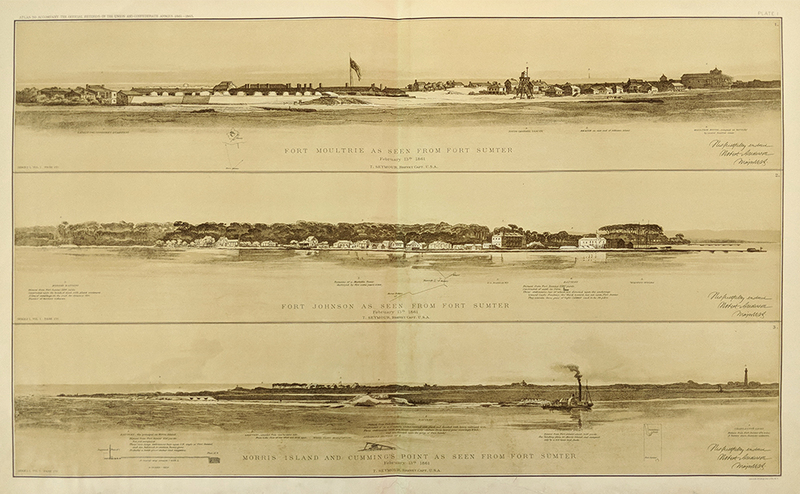 Inset: Plan of Charleston, Vicinity and Harbor. Hand colored, lithograph. 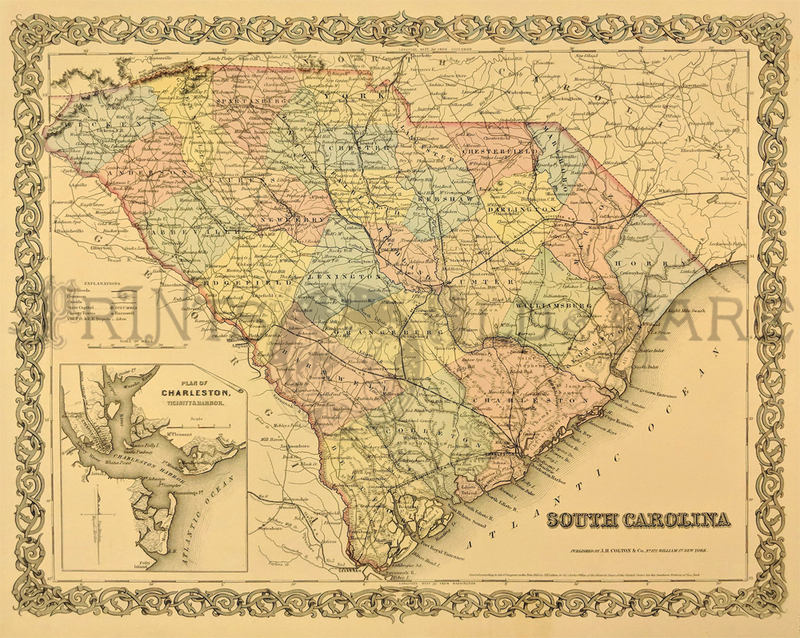 State of South Carolina Map published by Thomas, Cowperthwait & Co. 1850. 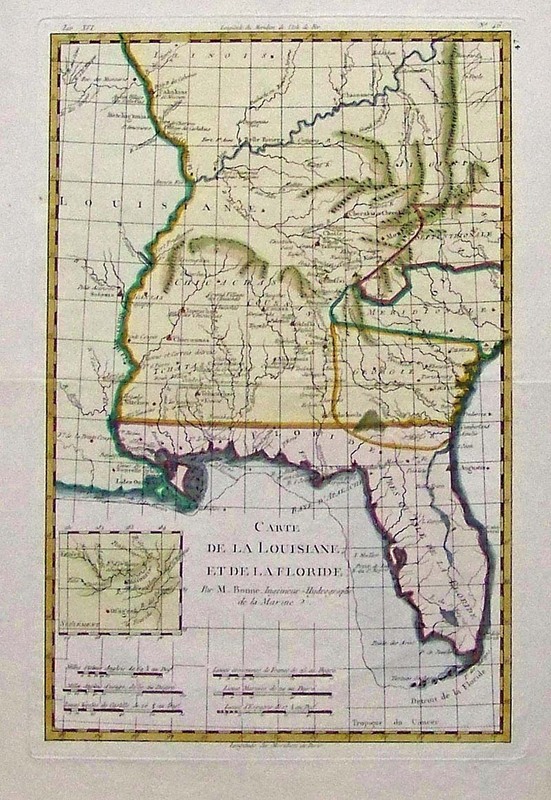 Hand colored map which shows Canals, Roads, Railroad, Stage and Steam Boat routes. 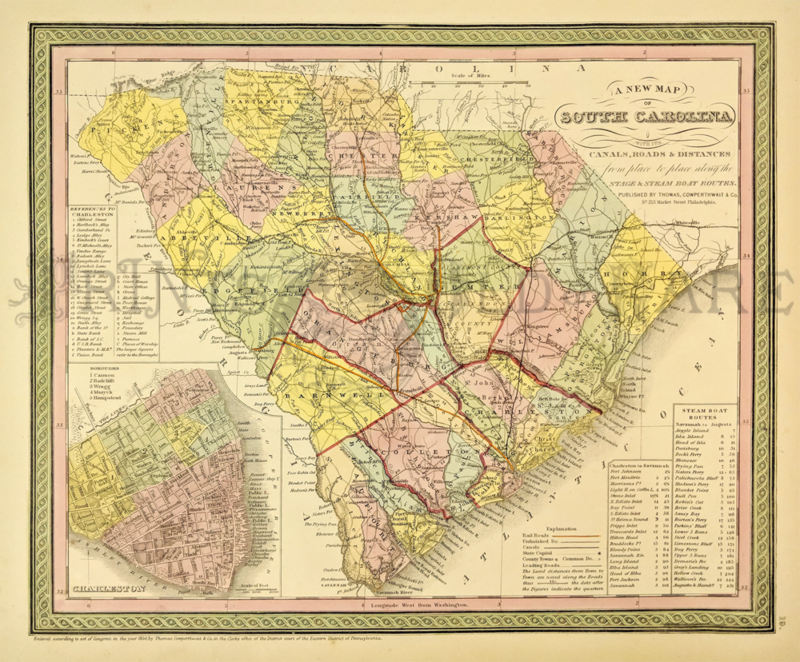 Inset depicts a Map of Charleston and it's Boroughs. 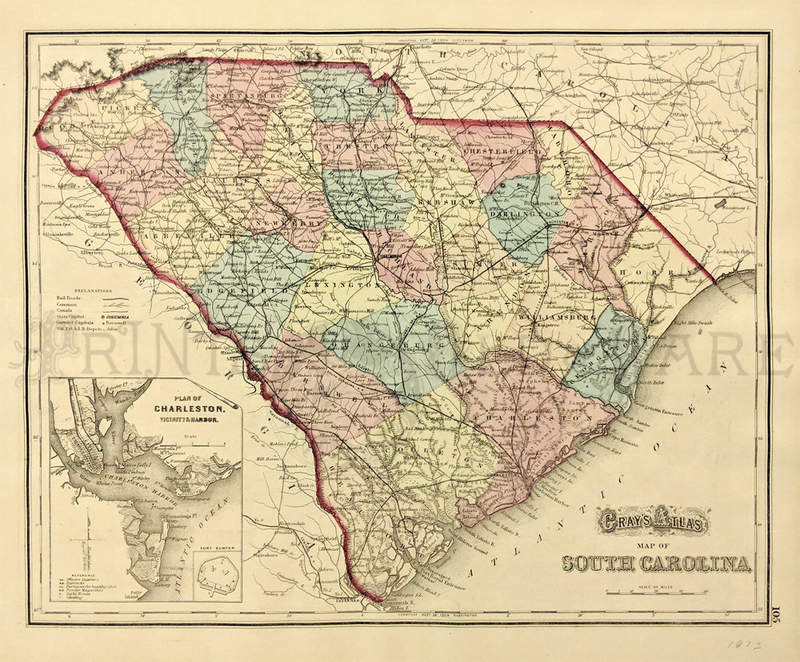 1855 South Carolina Map, published by J.H. Colton. Shows towns, cities, railroads, roads and some topographical features. 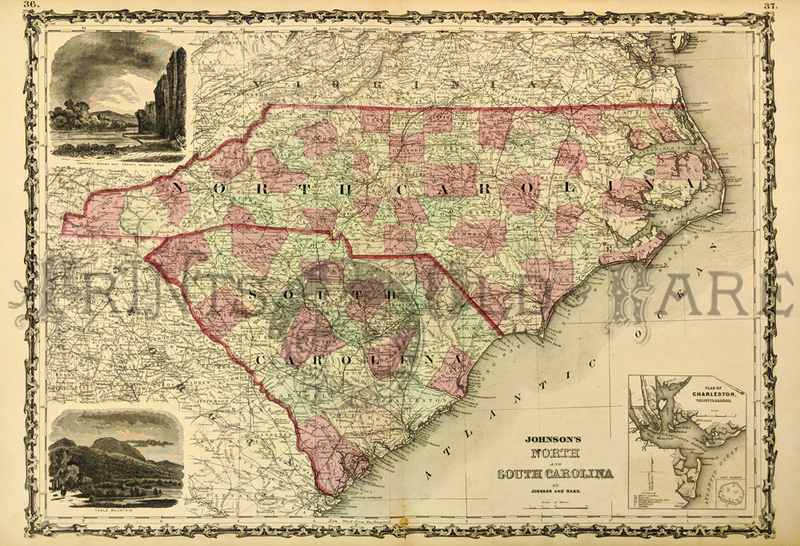 Inset of Charleston and Vicinity in the lower left, which names the Blue Ridge Mountains. 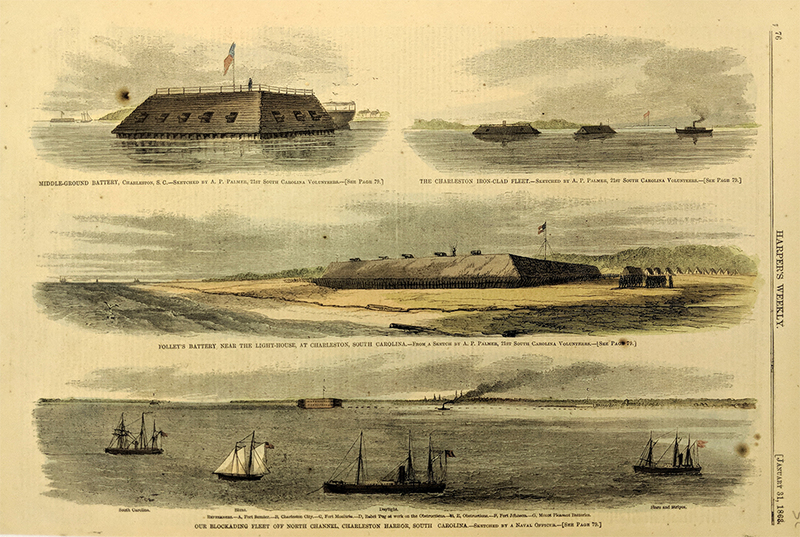 Sepia tone views of Forts Sumter and Moultrie. 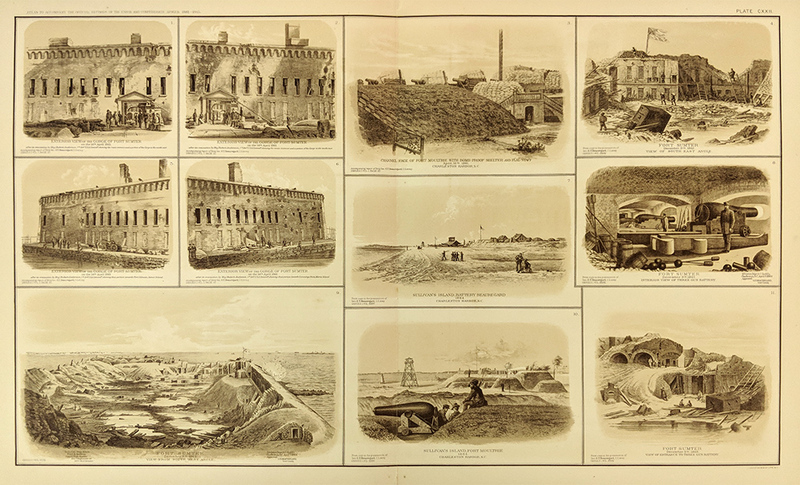 Shows interior and exterior views of the Forts. 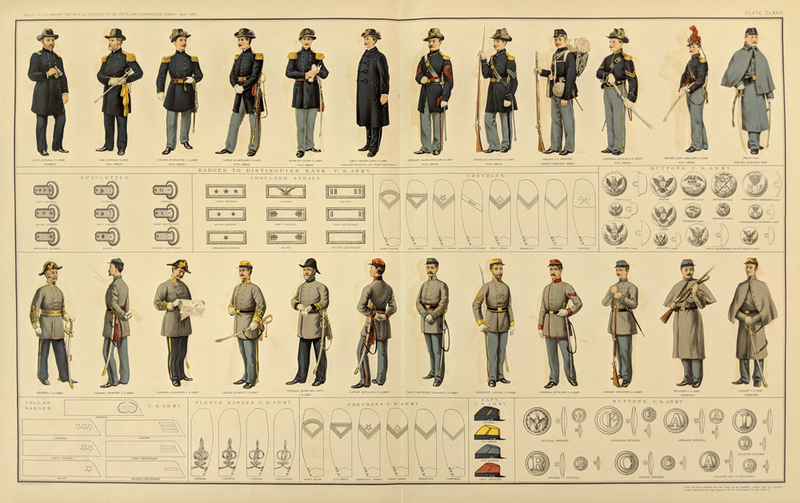 From the U.S. Government's official atlas of Civil War records. 1883 South Carolina - Objects and Places of Interest In and Around the City of Charleston. - From Sketches By C. Upham. 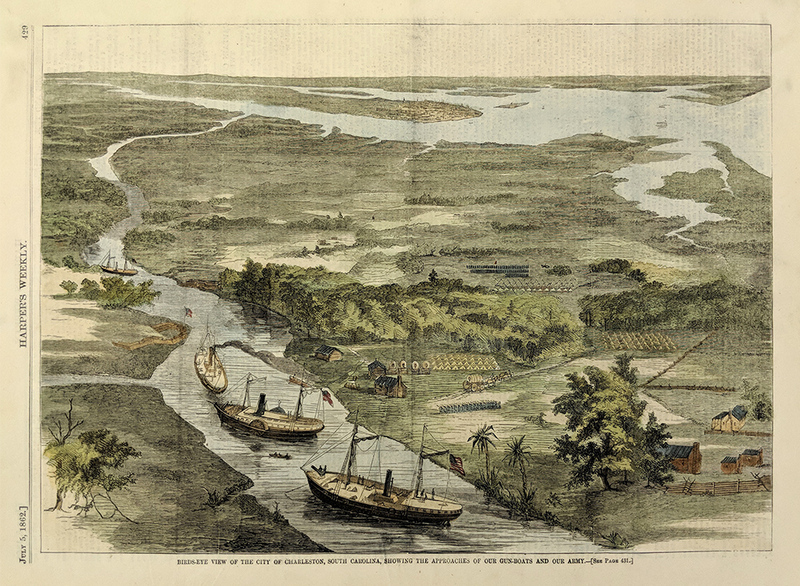 Eight hand colored wood engravings published on one page which depict places of interest in and around the city of Charleston. Published in Frank Leslie's Illustrated Newspaper on October 20, 1883. 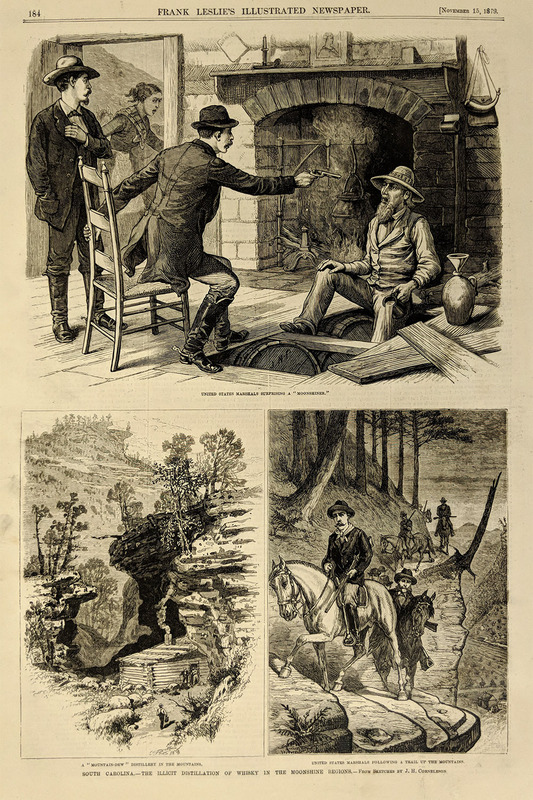 1879 Moonshine: Illicit Distillation of Whiskey - U.S Marshalls Tracking Moonshine. Rare View. 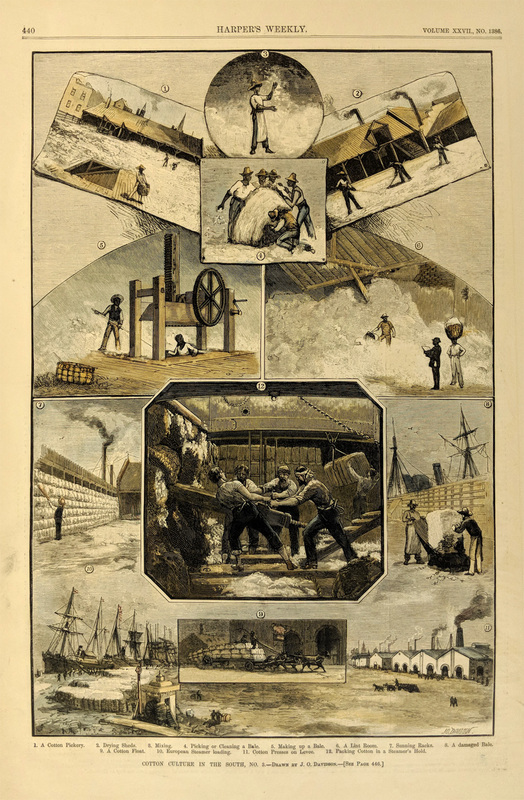 Wood engraving from Frank Leslie's Illustrated Newspaper.